Originally published in the Puget Sound Business Journal. Digital creative agency 8ninths was founded by former Microsoft veterans, Adam Sheppard and William Lai and taps their collective tech talent to give customers a new way to showcase their brands. The company has worked with Holland America, Toyota and the Sounders FC. Now it’s specifically branching into branding through augmented reality and virtual reality (VR) experiences. In a recent release its free app “The Box,” 8ninths strives to show customers that its short form VR format has the potential to become the predominant way to receive and relive VR experiences. 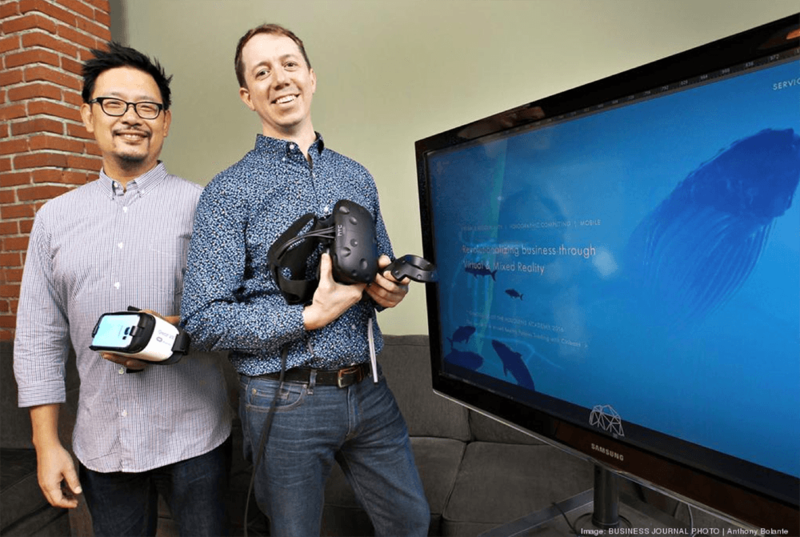 The Seattle company’s app is already in the Samsung Gear VR Oculus Store and will be available on Cardboard VR and other platforms later this year. What problems are you solving? Digi-Capital forecasts that augmented reality and virtual reality will be a $120 billion market by 2020. With more than $1 billion invested in the industry over the past year, 2016 will be a landmark year for VR tech, and we will see a number of new platforms in stores such as Cardboard VR, Oculus, HTC Vive, Hololens and Magic Leap. We believe that there is a big market beyond just games, creating new experiences for reaching consumers and enhancing the workplace through holographic computing. How do you pay the bills? After leaving Microsoft we bootstrapped 8ninths with our own funds just as the economy was tanking. Those lean years really helped shape our philosophy of efficient execution and as a result we built a different kind of agency focused on helping large brands reach their audiences through innovative uses of technology. For the last eight years we’ve been building world-class web and mobile applications that do just that for our clients. As we move into the virtual and mixed reality space we see a large number of opportunities for entirely new classes of products, especially in the enterprise sphere that have never even been conceived of before. We anticipate raising money in 2016 to build enterprise software specifically around virtual and holographic computing. When your phone starts ringing off the hook with new customers, how will you keep up? Our team’s experience at Microsoft leads us to believe that we have the strong fundamentals in place to handle growth. Also, we are very adept at managing multiple projects simultaneously while maintaining a very high-quality bar. The nature of VR design is one of very rapid ideation, iteration and collaboration between team members. We keep the teams small and focused and are scaling through a combination of knowledge sharing to other team members and hiring the best and the brightest who are keen to work with us on such cutting edge new tech. How do you plan to make money? Brands are always looking for innovative ways to engage with their consumers, and we believe that VR is no exception. We are already starting to see the market emerge for branded experiences within VR. On the Mixed Reality front, Microsoft has shown many ways in which Hololens can transform almost every industry from health care, to education, engineering, retail and more. We anticipate high demand for the unique set of skills required to develop in this space. What keeps you up at night? The VR space has a lot of buzz right now and the next 12 months will be telling in terms of adoption among consumers, primarily for gaming and entertainment. As with any new technology there’s a risk that adoption might not be as huge as expected but our instincts are that with so many big players involved such as Microsoft, Google, Facebook, etc. there’s a good chance that what we’re seeing is the foundation for a new era of computing that will free us from a 2D screen. David Thacher left Microsoft after 18 years building products and is now an active angel investor through the Alliance of Angels. Exciting business focus: 8Ninths is building on its strong record in digital design services to a new focus on virtual reality (VR) (and Mixed Reality) applications. VR is the one of the hottest emerging technology today and it seems a good bet that there will be a demand from advertisers to use it for campaigns that need leading edge consumer appeal. Lower risk strategy: Unlike start-ups trying to build VR hardware or low level software, potentially competing with the biggest technology companies, 8Ninths is taking a much lower risk approach by focusing on becoming experts in the use of VR tools and providing agency services with that expertise. Established business record: 8Ninths has eight years’ experience working with enterprise customers on advanced digital needs. They’ve run lean and funded their growth out of profits. Strong team: The founders bring strong expertise and have built a team that is used to working with the latest and greatest digital tools. This should position them well as they focus on designing compelling applications for emerging VR technologies. Balancing speed and quality: 8Ninths wants to grow quickly to establish itself as a leader in the new VR design services market. They’ll need to manage rapid personnel growth while mastering the many new technologies in a fast-evolving field. Achieving leadership status with enterprise customers will require they do both with high quality. Pivot: 8Ninths wants to expand beyond providing creative services to begin to sell VR application software to large customers. This is a new focus and the pivot from a services business to building and selling software tools is a major shift that will likely require different technical and development expertise. Finding employees with the needed skills in this over-heated employment market will be challenging. Exit: Investors will want to know about 8Ninth’s exit plan. As a digital agency, 8Ninths would naturally look for a sale to a major agency that needed to bolster its VR expertise. The enterprise software effort could complicate that, although if successful it will also attract deep-pocket acquirers.